An enormous amount of energy and resources of the Jewish community go into working with teens – reaching out to them, encouraging them to stay connected to Jewish life and community after their bnei mitzvah, and ultimately providing them with a strong reservoir of Jewish commitment that they can draw on when they go on to college and independent life. 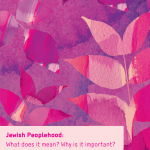 Much of the resources of the Center for Jewish Peoplehood Education focus on teens and their interests. This is also true of the CJPE’s core publication, the Peoplehood Papers. The most recent edition of the Peoplehood Papers focuses on teen leadership, in partnership with the Diller Teen Fellowship program. Check out Josh Miller’s article on “Essential Lessons for Educating Jewish Teens”. Amongst other things, Miller argues that “Jewish adults who seek to educate teens need to first set aside their adult Jewish agendas and constructs—whether in politics, ideology, or desired attitudes and behaviors. If we have specific lessons to impart to teens, our challenge is to set them aside and begin by earning their trust. Then we can guide our teens towards experiences where we invite them to come to their own conclusions about Jewish topics that we believe are important.” See more about Josh Miller’s work with the Jim Joseph Foundation’s teen engagement initiative. For the full article, download the Peoplehood Papers. What do you think are the essential lessons of working with teens? PreviousPrevious post:Get Ready for Purim!NextNext post:Professional Development Resource for Educators: Join our new seminar series!